A Virginia Beach police officer is under investigation for using excessive force on a group of teenage friends after pulling them over for a minor traffic violation, which lead to a young man being pepper-sprayed and the friends being traumatized by the officer’s actions. The driver, 18-year-old Courtney Griffith, was stopped for a bulb on her license plate being burnt out. The officer approached the car in an aggressive manner and Griffith quickly started recording with her iPhone. Like other incidents in which aggressors have been discovered with the use of video recording devices, the officer’s actions were recorded as he became irate with the teens, eventually leading to a 17-year-old young man being pepper sprayed multiple times as he sat in the back seat, requesting his mother be contacted prior to being removed from the car. In an attempt to cover up his actions, the officer deleted the video from the iPhone, unaware it simply moved to the recently deleted folder. According to 13 News Now, the incident took place on January 10. Courtney Griffith was driving with the father of her child and a 17-year-old friend. The group of teens had just pulled into Griffith’s driveway when the police officer flashed his lights and pulled them over. 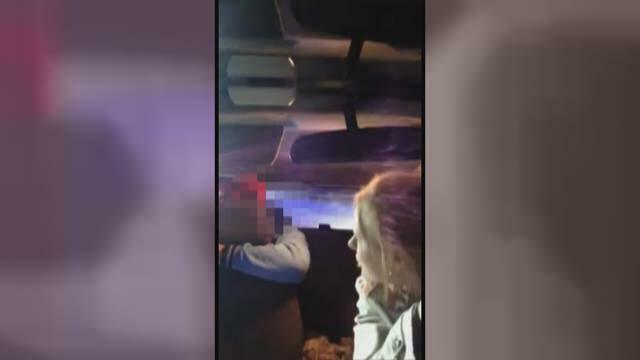 She began recording when the officer’s attitude signaled that he might become violent. The broken taillight became an afterthought as the officer recognized Griffith as someone he had arrested prior for marijuana possession. The officer stated that he smelled marijuana in the car, which Griffith vehemently denied. He demanded each of the passengers get out of the car, according to the Free Thought Project, but the 17-year-old refused until his mother was called. The officer denied the request and sprayed the young man, who seemingly did nothing to deserve the forceful attack. The officer then yelled at the teen to get out, or he would pepper spray him again. The teen said “alright” to signal that he would comply, yet the officer pepper sprayed him again. The officer then violently pulled the boy from the car, hitting him in the process while screaming at him. The teen boy was arrested for resisting arrest and battery on a police officer, and is currently in jail where he will stay until at least July. Griffith shared her story, hoping to the officer is brought to justice for his actions. In all, four police cars were on the scene, and one of the officers attempted to delete the video. Jim Cervera, the police chief, reviewed the video and stated that he was “very uncomfortable” watching and that a full investigation would be conducted.